Some documents need to be certified by a legal representative such as a solicitor or Notary Public. A certified document needs to be signed in front of a witness who affirms the signature is your true one; and in the case of a copied document, warrants that the copy is true and identical to the original one. The certifier declares this to be true and adds their signature and the date. Personalised X509 PKI Digital Signature technology offers Certify Signature as a function to Certify PDF documents. This signature locks the document and prevents adding additional content or signatures (unless it is intended and signature fields are added before certifying), the Certify Signature seals the document with a recognised professional seal, time stamp, and graphic signature image. Using Secured Signing's Certify function to certify and add approval signatures to a document is the digital equivalent of a notarised wet signature; it assures recipients that the document is authentic, originates from a verified source, and has not been tampered with. This gives you the utmost control of your electronic format of signed documents. Who can benefit from using Certify? eNotary enables a Notary Public to notarise documents in electronic format. eNotary uses Secured Signing's Personalised X509 PKI Digital Signature technology with a digital notary seal that certifies and validates electronic documents with a digital certificate. The many benefits to having such an online notarisation process include cost savings, greater security, immediate detailed audit trails, and the document's data integrity — none of which are available in paper-based notarisations. Secured Signing simplifies the process of document notarisation. 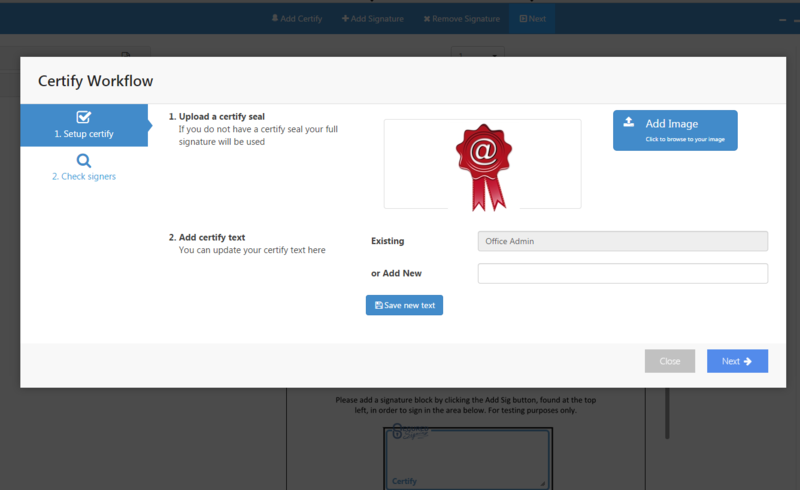 Simply upload the document you need to certify, and click the Certify button. 1. On the Certify page, add Certify Signature and position it on the document. 2. Add client / approval signatures and position them on the document, if needed. 3. If this is the first time you are using the Certify function, you will be required to capture your certify / seal signature and add the text that goes with it. 4. 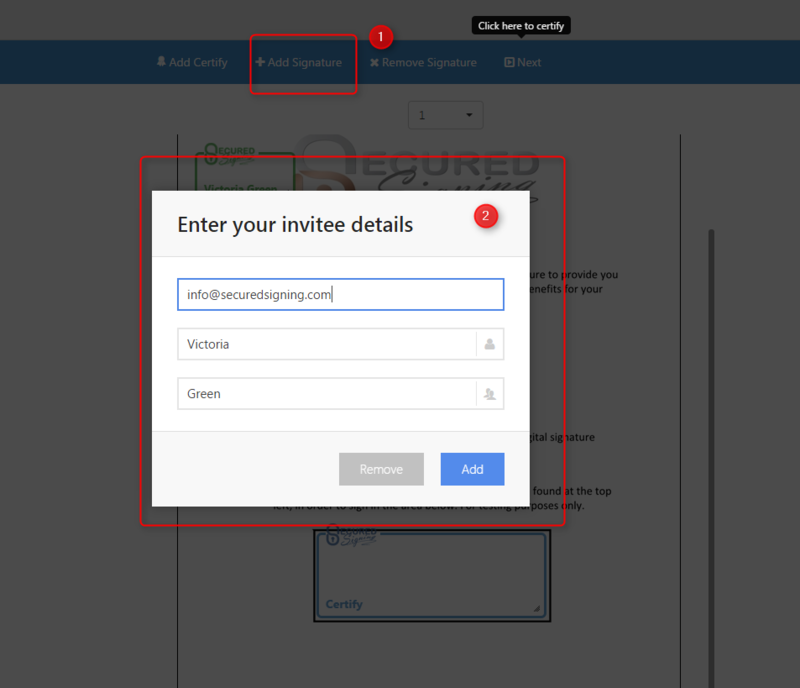 Certify workflow: tick the box if you need to send an email invitation to your clients to remotely sign online, or un-tick it if they are with you in the same room. 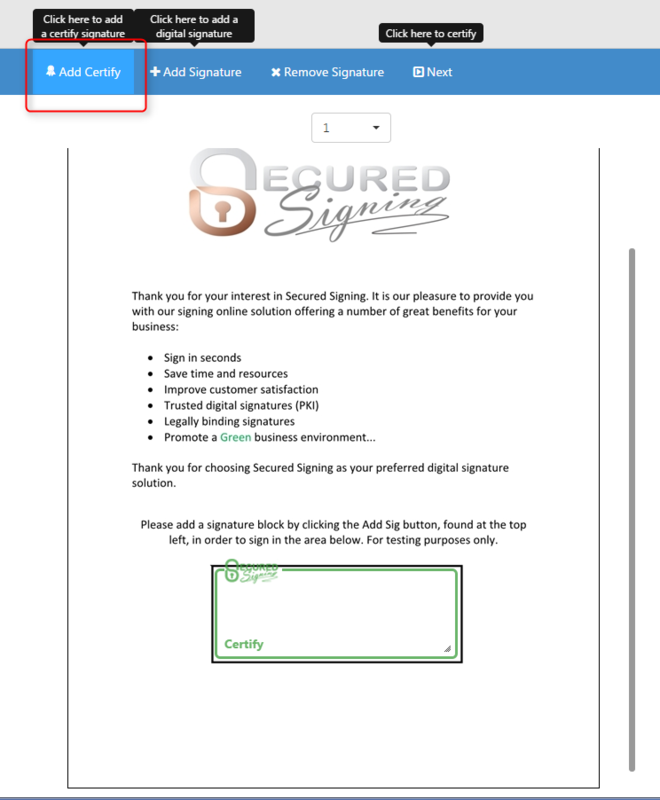 If your clients are present, the Secured Signing system allows them to sign while you are witnessing (with your signature), their signature ceremony. At the end of the signing process, the initiator can download the notarised document and email it to the parties involved. Please provide the number of user's and document's that you require. You have requested a quote for a custom plan! We will email you shortly with a plan price.